The AARDA (American Autoimmune Related Diseases Association) posits that about 50 million people in the United States have problems stemming from autoimmune disorders. Significantly more women than men are affected by autoimmune conditions. Indeed, these ailments are ranked among the top ten causes of death for women aged below 65 years. There are at least 80 known types of autoimmune diseases and they come with wide ranging symptoms on various areas of the human body and different degrees of severity. Let’s start by demystifying what autoimmune disorders are. While autoimmune conditions are of different types and can impact on various organs, they’re all essentially the same in the sense that they’re the body’s immune response to some kinds of inflammations which result to the body attacking itself. The immune set up is highly sophisticated in its function of safeguarding the body against disease causing invaders such as bacteria as well as viruses. Whenever the immune system considers something as harmful, it produces antibodies to keep the pathogens at bay. Autoimmune conditions come about when the body works hard to fend off possibly harmful intruders like allergens, toxins, infections or some kinds of food and the immune system fails to distinguish between the dangerous intruders and the rightful areas of our biology. When the body mistakenly deems some of its tissues as injurious, it directs the antibodies to attack itself and damages the organs. 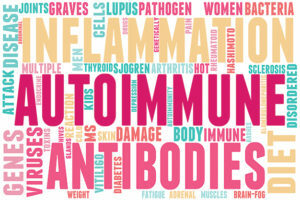 Treating autoimmune disease can be tricky because it is so complex. Holistic medical solutions such as acupuncture, Chinese herbal medicine and functional nutrition have received a lot of attention due to their efficacy in treating widespread autoimmune symptoms including pain, inflammation, fatigue, skin eruption, digestive disorders and others, while regulating the immune system and improving overall quality of life. The actual cause of autoimmune conditions is not known. Many factors combine and lead to the development of these disorders. However, there’s a genetic component involved for sure. The genes behind autoimmune diseases get turned on by influences like infections, toxins and viruses. 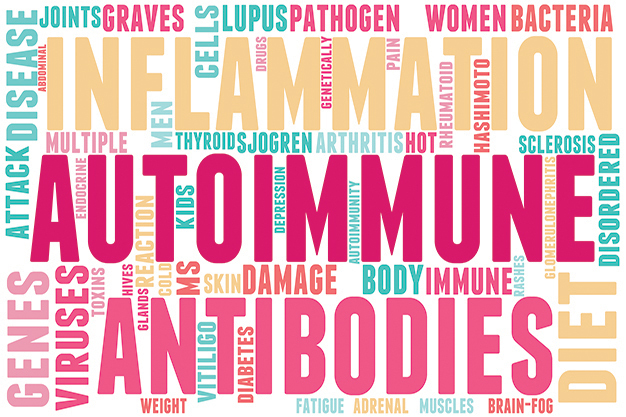 What are the most common types of autoimmune disorders? Multiple sclerosis is a condition that impacts on the nervous system. Symptoms depend on the area of the nervous system that is affected and can include paralysis, numbness as well as vision impairment. Psoriasis. This is a skin condition that’s symptomized by thickening and reddening of the skin. Rheumatoid arthritis, which is a condition that impacts on joints. Some symptoms are swelling and deformation of joints. Additionally, the symptoms of rheumatoid arthritis can extend to the heart, lungs as well as eyes. Learn how Chinese herbs can treat RA. Scleroderma. This is a condition of the skin as well as other body organs. It can cause development of scar tissues, stiffness of joints and ulcers of the skin. Lupus erythematosus impacts on connective tissues and it may affect just any body organ system. This condition is mainly symptomized by fever, rash on the face and weight loss. Grave’s disease. This impacts on the thyroid glands. Some symptoms are anxiety, increased heartbeat, diarrhea and weight loss. In a bid to limit overactive immune response that accompanies autoimmune disorders, practitioners of Western medicine usually administer corticosteroids as well as immuno-suppressants like Azathioprine or Cyclophosphamide. However, these medications are known to have severe side effects to most patients. Indeed, the regular use of these drugs has resulted to deaths in some cases. As such, alternative effective treatment methods that have no side effects like acupuncture become necessary. Numerous researches have been carried out in a bid to establish why Chinese medicine, and acupuncture to be precise, is so effective in treating autoimmune conditions. Undeniably, Chinese medicine has no explanation regarding the pathology of autoimmune conditions because early practitioners of Chinese medicine definitely didn’t have to deal with the widespread immune epidemic that stems from our current poor diet and lifestyle. However, an acupuncturist can identify the different patterns exhibited by these ailments and offer successful treatment by following the holistic model. Unlike Western medicine, Chinese medicine emphasizes on treating the various autoimmune diseases from an holistic perspective. Xu Dachun described an autoimmune condition as one in which the body’s qi combines with that of an invader. He gave the analogy of pouring oil to flour whereby it becomes impossible to separate the mixture. In such circumstances, as the body tries to fend off the pathogens, it may be hurting itself and exacerbating the problem. This is synonymous with the Western medicine viewpoint that autoimmune disorders occur when the body’s immune system participates in attacking the same body it ought to be protecting. The chronic nature of autoimmune conditions has made researchers such as acupuncturists Zhou Xueping as well as Lin Jiehou believe that it starts off as a consequence of the existence of a deficiency syndrome. In short, the pathogens or causative agents develop dominance and manifest due to deficiency of some kind. If the meridians or channels are full of blood and qi, as well as in optimal functioning condition, the sufferer would always stay healthy and only experience minor and short-lived ill-health. On the contrary, deficiencies give room for the invaders to enable disease progression and make the condition serious by causing resistance to efforts of normalizing the effects. Chinese medicine holds that autoimmune conditions happen when the flow of the vital energy, qi, is disrupted or blocked. The purpose of acupuncture is to restore the normal flow of qi by treating the actual cause of the condition as well as addressing the specific symptoms of the said autoimmune condition. Clinical researches have shown that acupuncture pushes the body to release proteins, hormones as well as brain chemicals responsible for various body functions. As such, acupuncture positively impacts on blood circulation, internal body temperature and the wellbeing of the human immune system. Over the years, numerous patients of autoimmune conditions like Multiple Sclerosis, Lupus, Scleroderma, Hashimotos Thyroiditis, Sjogrens syndrome, Interstitial Cystitis and more have healed completely or shown remarkable improvement of their conditions due to acupuncture treatment. Better results have been reported when acupuncture is combined with therapies like physical activities with moderation, herbal medications, stress reducing therapies and nutritional aid. While the use of acupuncture for autoimmune issues is a relatively new phenomenon in the Western world, it is quickly catching on as news of its efficacy spread. It is estimated that by 2020, tens of millions of Americans will add themselves to the list of those who believe in this approach to treating autoimmune issues. Schedule a free consultation today with Dr. Robert Herbst or Dr. Landon Agoado to learn more about how acupuncture can be highly effective at reversing many of your autoimmune symptoms. They have had much success treating autoimmune conditions of many varieties, and they are confident that they can help you too!